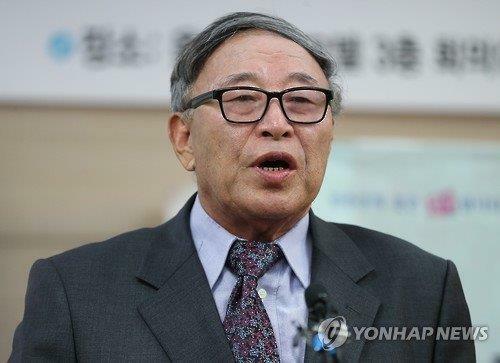 SEOUL, Nov. 30 (Yonhap) -- Former professional championship-winning manager Kim Euong-yong was elected president of the national amateur baseball governing body on Wednesday. Kim beat former lawmaker Lee Kye-ahn 85-41 in a vote held in Seoul for the top post at the Korea Baseball and Softball Association. Kim's term is four years. Kim, a 76-year-old baseball lifer who won a record 10 championships in the Korea Baseball Organization (KBO) with two franchises, will take over the organization. These issues forced the formerly Korea Baseball Association (KBA) to enter receivership by the Korea Olympic Committee (KOC) in March. Three months later, the KBA merged with the Korea Softball Federation and Korea Baseball Federation, a smaller amateur baseball body. During his campaign, Kim pledged to bring more financial stability to amateur baseball and to strengthen the game at the grassroots level. He also promised 2 billion won (US$1.7 million) in annual operational costs will come out of his own pocket, and that he will also try to win corporate sponsorships. Kim said he'd seek to build more softball-only stadiums and add infrastructure for women's baseball, and increase the number of high school baseball teams from the current 71 up to 100 on his watch. Kim had the backing of the Korea Professional Baseball Players Association, the Korea Professional Baseball Alumni Association, a body of retired players, and the Ilgoo Club, made up of former and active coaches and managers. They claimed it was finally time for a baseball man to take the helm, since politicians and corporate executives had driven the baseball body to ruins. Kim is the winningest manager in the KBO's 34-year history, with 1,567 regular season victories. He led the Haitai Tigers to nine championships, including four in a row starting in 1986. Kim took over the Samsung Lions in 2001 and earned his 10th title the following season. In 2004, he was promoted to the Lions' president, becoming the first former manager or player to assume the role with any KBO club.